Deciding to move abroad requires a lot of courage, more than most people can muster. The next step, choosing specifically where on our vast planet to live, takes meticulous research and brutally honest soul searching. Proximity to our children (and now four grandchildren) was essential, instantly ruling out desirable but far-flung destinations like Thailand and Indonesia. Our focus thus quickly centered on Latin America, and through International Living we discovered a city we’d never heard of in a country we knew next to nothing about…Cuenca, Ecuador. We had developed a specific checklist of qualities we were seeking in our ideal retirement location (we highly recommend you do the same), and Cuenca seemed to check all the boxes. An investigative trip confirmed our research and in May 2010, we stepped off the plane to begin our overseas adventure. We’d like to share our four most important reasons for moving to Cuenca, along with a special bonus feature that wasn’t around when we arrived. The temperate climate and low cost of living are just two of the reasons Cuenca is an ideal retirement destination. When it comes to weather we’re like Goldilocks: not too hot, not too cold—just right! Reading about the next snow storm, tornado, or heat wave in the States always reminds us how fortunate we are to have left all those shenanigans behind. Sitting at 8,400 feet in the southern Andes near the equator, Cuenca is blessed with temperatures ranging from highs in the 70s to lows in the 50s year round. That means no need for heating or air conditioning. Are you tired of shoveling snow, sweating bullets, and paying exorbitant utility bills during seasonal weather extremes? Cuenca’s mild climate may be just the ticket. Finding a lower cost of living was one of our motivations for moving abroad. But we had no desire to settle for a lower standard of living, or to sacrifice safety for monetary savings. While it would be disingenuous to claim that our lifestyle in Cuenca is identical to the U.S., we certainly lack for nothing of importance. We rent a gorgeous two-story penthouse apartment in one of the best areas of the city. We eat out regularly, have memberships at a gym and yoga studio, buy fresh flowers, get in-home Thai massages, and enjoy the services of a weekly housekeeper. All for a budget of less than $1,800 per month. 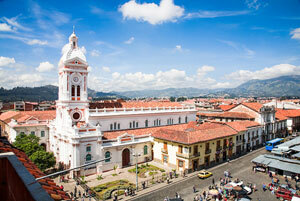 Cuenca offers an affordable lifestyle for a fraction of the cost of the U.S. The same holds true for medical care. 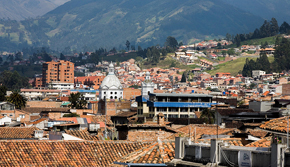 Cuenca, along with Ecuador’s capital Quito and largest city Guayaquil, has top notch hospitals, clinics, and physicians, often at costs as low as one tenth of what you would pay in the States. Same-day appointments (with the doctor spending as much time as necessary to administer proper care) run from $30 for a general practitioner to $40 for a specialist. There is no charge for follow-up appointments for the same condition. Facilities are modern and many physicians have trained abroad and speak excellent English. We are members of Ecuador’s Social Security healthcare system and as a couple pay just over $80 per month for 100% coverage with no age or pre-existing condition restrictions. Cuenca is a big city that holds its small-town feel…allowing expats to enjoy the best of both worlds. We love the stimulation of a city—the malls, cinemas, restaurants, parks, symphony, art galleries, and museums. Cuenca has all these amenities and more. Yet with a population of only around 500,000, the city retains a most agreeable small-town charm and manageable size. Unless you are currently a resident of a large metropolis or a tiny village, you might find it surprising to know that we do not own a vehicle here in Cuenca. Nor do we ever want to. It’s a joy to be able to walk to almost all of our daily activities. Cross-town journeys via a 25 cent bus fare or $2 taxi ride take less than 20 minutes. These four reasons that originally drew us to Cuenca are all just as viable now as when we arrived almost six years ago. But there’s a bonus feature we never anticipated that has been our most pleasant surprise. 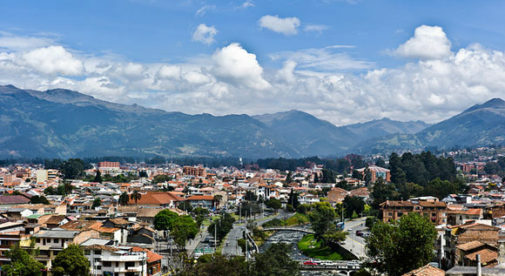 At the beginning of 2010 there were perhaps 500 expats in Cuenca. That number has now swelled to an estimated 5,000, but don’t be concerned about a disruptive “gringo invasion.” Representing only 1% of the population, we expats have had no real negative impact on the prices of goods and services (including real estate) or local culture. But consider the positive aspects of a growing expat community. More people means more talents and interests, , which has translated into everything from restaurants to computer services to charities to bilingual worship services. There are now such activities as knitting groups, bridge clubs, and community theaters—all unimaginable when we were expat rookies trying to figure out how to get our water turned on! Cuenca is an absolutely phenomenal place to retire, and it keeps getting better. Constant infrastructure improvements to parks, roads, and sidewalks; a new light rail system that will soon rid the historic district of many buses; planned pedestrian-only areas of downtown with flower boxes, al fresco dining and boutiques—maybe you should plan to come and check out Cuenca for yourself.